The Bobbilicious Files: I Won! 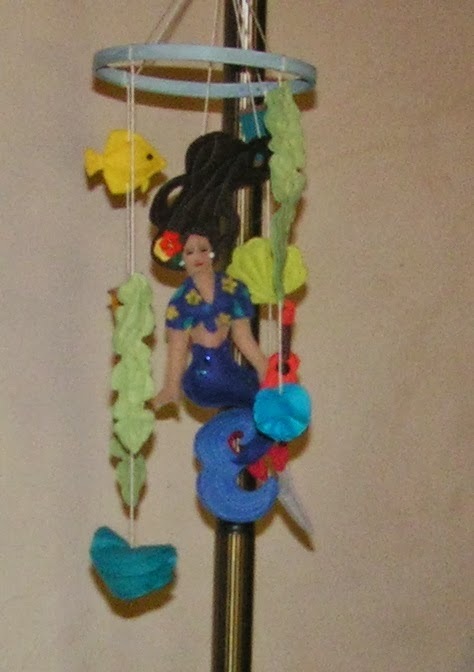 Recently the Wearing History blog hosted a giveaway - the prize was a beautiful, handmade, sewing-inspired mobile featuring a mermaid. And I won! Yay! I'm not much of a cat person - they annoy the heck out of me - but this one seems to have taken a liking to me. She almost always climbs on my lap while I'm watching my shows and she lays quietly while I'm moving around - none of the crazy crawling all over and getting behind furniture business that makes me crazy. You can see that she has some problems with her legs. 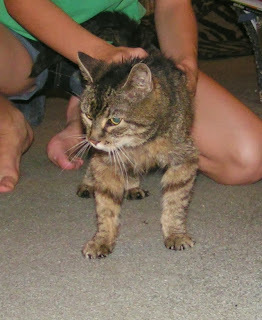 We're gathering up some money to take her to a vet to get checked out. Since she's had some food and a place to relax she's much calmer than when she got here. I'm still not sure about having a pet (feeding kids is enough work!) but we may well have a new family member. I just hope she leaves my knitting alone!